The semiconductor technology has rapidly evolved with the development of more advanced product and process technologies for various end users, applications, and verticals across the supply chain. For instance, according to Semiconductor Industry Association (2014); the worldwide sales for the semiconductors industry have increased from USD 77.3 Billion in 1993 to USD 305.6 Billion in 2013, with an average annual rate of increase of 7.11% per year. Moreover, the WSTS Fall 2014 Semiconductor Industry Forecast predicts the worldwide semiconductor industry sales to reach USD 345 Billion in 2015 and USD 355 Billion in 2016. Some of the major growth drivers for the semiconductor industry are the upsurge in the consumer electronics market, growing investments from public and private firms, strong research initiatives, growing market for integrated circuits, and advancements in the sensors market among others. Electronics and semiconductor devices are made up of small components which need to be placed properly and accurately over the device; any misconnection or malfunctioning of these components can affect the functioning of the device. The liquid encapsulation technique plays a vital role in this. Threats such as misconnection of electronic components, managing complex structure without affecting the performance of device, and so on are handled efficiently with the help of liquid encapsulation materials. The global liquid encapsulation market is projected to grow at a CAGR of 6.7% between 2015 and 2020, from an estimated value of USD 1,011.97 Million in 2015 to reach USD 1,397.46 Million by 2020. With regard to the various products considered for this market, integrated circuits are estimated to account for more than 75% of the total market till 2020. Similarly, electronics applications are considered to hold the major market share among all the applications till 2020. The report on global liquid encapsulation materials also analyzes the value chain for the market. The global market has been segmented on the basis of material, product, application, and geography (Americas, Europe, APAC, and RoW). The report also evaluates various market trends and dynamics in the global market such as drivers, restraints, opportunities, and challenges. This market research report profiles some of the key technological developments in the recent times. It also profiles some of the leading players in the market and analyzes their key strategies. The competitive landscape section of the report provides a clear insight into the market ranking analysis of the key players. The global liquid encapsulation materials market also analyzes the major strategies adopted by the players to expand their geographic presence and to consolidate their position in the market. The major players in the global liquid encapsulation market are Shin-Etsu Chemical Co., Ltd. (Japan), Sumitomo Bakelite Co., Ltd. (Japan), Hitachi Chemical Co. Ltd. (Japan), Henkel AG and Co. KGaA (Germany), Kyocera Corporation (Japan), Nagase & Co., Ltd. (Japan), Nitto Denko Corporation (Japan), Panasonic Corporation (Japan), BASF Se (Germany), Sanyu Rec Co. Ltd. (Japan), Resin Technical Systems (U.K.), and Epic Resins (U.S.) among others. Market, by Material: The global liquid encapsulation materials market has been segmented on the basis of material into epoxy resin, epoxy-modified resin, and others (catalysts, hardeners, and colorants). 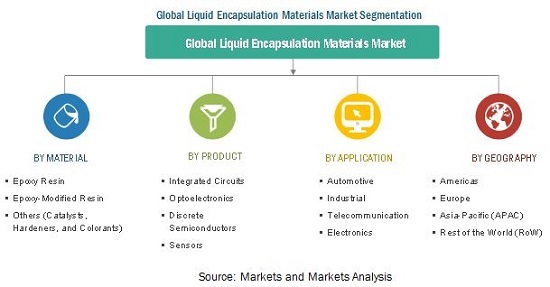 Market, by Product: The global liquid encapsulation market has been segmented on the basis of product into integrated circuits, optoelectronics, discrete semiconductor, and sensors. Market, by Application: The global liquid encapsulation market has been segmented on the basis of application into automotive, industrial, telecommunication, and electronics. Market, by Geography: The report segments the global liquid encapsulation material market into four major geographic regions, namely, the Americas, Europe, APAC, and RoW. The Americas market for liquid encapsulation materials has been further segmented into North America (the U.S., Canada, and Rest of North America) and South America. Europe includes the U.K., Germany, France, Italy, and Rest of Europe; APAC includes China, Japan, Taiwan, South Korea, and Rest of APAC; and RoW includes the Middle East and Africa. Encapsulation is one of the advanced packaging processes of almost all semiconductor devices that offer low stress, low warpage, and high thermal conductivity. Encapsulation can be of two forms, namely, solid and liquid. Solid encapsulants are epoxy-molding compounds (EMC) that are a blend of solid epoxy resins, hardeners, flame retardants, fillers, and several additives. Liquid encapsulants have similar compositions, but the resin and hardener are liquid and allow the material to be directly applied onto the chip; they interconnect typically by wire bonding instead of molding. Furthermore, the encapsulants can be of three types, namely, glass, ceramic, & metal (hermetic type), plastic (non-hermetic type), and polymer (near-hermetic package (NHP)). One of the major reasons for choosing the encapsulation technique for devices is the growing trend of miniaturization, where smaller and complex structures of devices can be managed without harming its performance. In the liquid encapsulation process, liquid encapsulant materials are implanted on the device to overcome issues such as misconnection of electrical components on devices and to ensure the proper functioning of the device. The global liquid encapsulation market is projected to grow at a CAGR of 6.7% between 2015 and 2020, from an estimated value of USD 1,011.97 Million in 2015 to USD 1,397.46 Million by 2020. APAC is estimated to account for more than 65% of the total market till 2020. It is also projected to be the fastest-growing region between 2015 and 2020 for this market, owing to the growing demand from sensors devices, wireless technologies, and optoelectronics segment. Moreover, APAC countries such as Japan, China, Taiwan, and South Korea are likely to offer a huge opportunity for the semiconductor liquid encapsulants market owing to the growing electronics and telecommunication sector in the region. The report describes the market trends and challenges for the global liquid encapsulation materials market and forecasts the market till 2020, on the basis of material, product, application, and geography. It also features a detailed competitive landscape which includes the identification of the key players in the global liquid encapsulation materials market, in addition to identifying the major strategies adopted by these players. 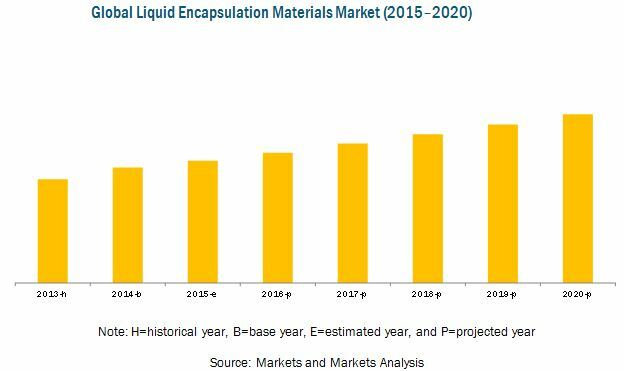 The report provides the drivers, restraints, opportunities, and challenges for the global liquid encapsulation market. The report estimates the global liquid encapsulation materials market in terms of value and also forecasts the same for the different regions, namely, the Americas, Europe, Asia–Pacific (APAC), and Rest of the World (RoW). It also involves the study of the market dynamics and trends in the global liquid encapsulation market. It profiles over 12 companies across the globe, along with their recent activities such as mergers & acquisitions, joint ventures, and new product developments. The global liquid encapsulation market is projected to grow at a CAGR of 6.7% between 2015 and 2020. Among all applications of global liquid encapsulation market, the electronics application is estimated to hold the major market share of the global market and telecommunication application is estimated to grow at the highest CAGR between 2015 and 2020. The market in APAC is expected to grow at the highest CAGR and is also estimated to hold the major market share till 2020. 12.2 Sumitomo Bakelite Co., Ltd.
12.6 Hitachi Chemical Co., Ltd.
12.8 Nagase & Co., Ltd.
12.13 Sanyu Rec Co., Ltd.